The new Mediator's Handbook 4th edition is out! Long an essential volume for mediators, the new edition has been completely rewritten front-to-back, while keeping the same accessible format and straight-forward writing style. It's been 16 years since the previous edition, and we've learned a lot since then. We've worked hard to make the mediation process steps and the mediator's moment-to-moment choice of approaches as clear and easy to remember as we can. Thanks, and let us know how you've used it! Order your copy from New Society Publishers. 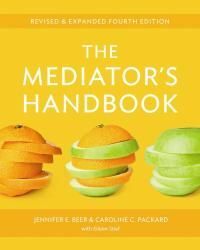 Check out the Mediator's Handbook website for more information about the contents, and for trainings and other events. This Culture-at-Work website is designed to help you work effectively in cross-cultural situations. Enjoy exploring the site. We hope you find ideas to be both thought-provoking and practical. We suggest some links below. Or you can head directly for the complete Table of Contents to see what else interests you. How to define the undefinable? A set of pages on Concepts of Culture ducks the question by instead looking at the many metaphors for culture one finds in the business world. Explore our popular Essential, Informed, & Intriguing Sites about Japanese Culture links page. We interviewed survivors, scholars, and activists for this Peace Talks Radio Program, which aired across the country. Walter Cronkite narrates this powerful hour-long documentary on nuclear disarmament and proliferation, starting with the experiences on-the-ground of Japanese survivors, and perspectives from American and Japanese veterans. It includes an interview with this year's Nobel Peace Prize winner, Dr. Mohamed ElBaradei, and some of Cronkite's first-hand experiences of covering the Hiroshima aftermath. This section looks at the basics of language, messages, signs, codes. One topic that seems to intrigue (and worry) negotiators is Non-verbal Communication in Negotiations. Listen online to the International Institute for Conflict Prevention and Resolution's Michael McIlWrath podcast conversations with Jenny Beer/ One is about community mediation and the Mediator's Handbook. The second podcast is about Cross-cultural issues in mediation. This section of the website has notes on various topics from the Negotiation & Dispute Resolution course Jenny Beer teaches at the University of Pennsylvania's Wharton School. Here's a page that takes a first look at the difficult questions of Ethics in Negotiation. We offer mediation, facilitation, and conflict coaching services. Call us to find out about custom-designed workshops and presentations on mediation, negotiation skills, and cross-cultural communication. Interested in a job, a career, or a life-change? Q & A: Working in Cross-cultural, Mediation, Conflict Resolution, or Peacemaking fields. Culture at WORK is edited and produced by business anthropologist and mediator Jennifer Beer, Ph.D., principal of JB Intercultural Consulting. Her independent consulting practice is located close to center city Philadelphia. Whether you're looking for training, mediation services, advice in handling a cross-cultural conflict, or a facilitator for important meetings ... We welcome your inquiries, your comments, and your business.